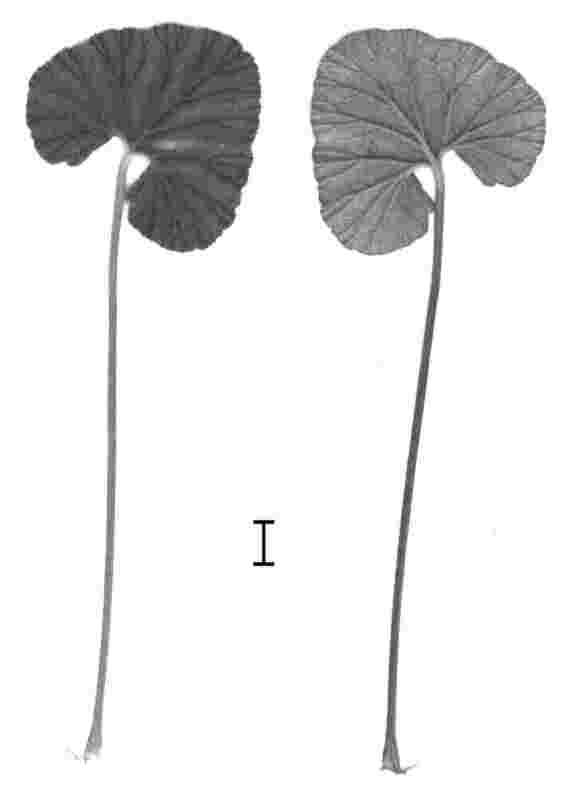 Leaves arranged in a rosette on short aerial branches, covered with remains of old petioles and stipules, when in flower 20-50 cm high. 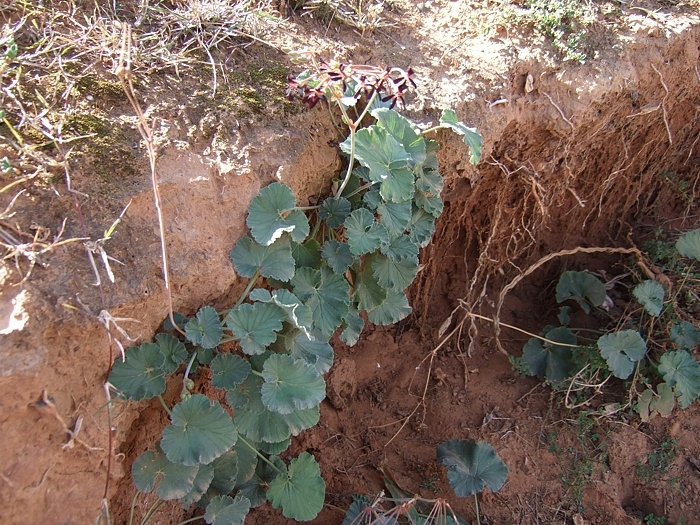 Thickened underground stems. Lamina simple, densely villous with glandular hairs interspersed, appearing silvery. 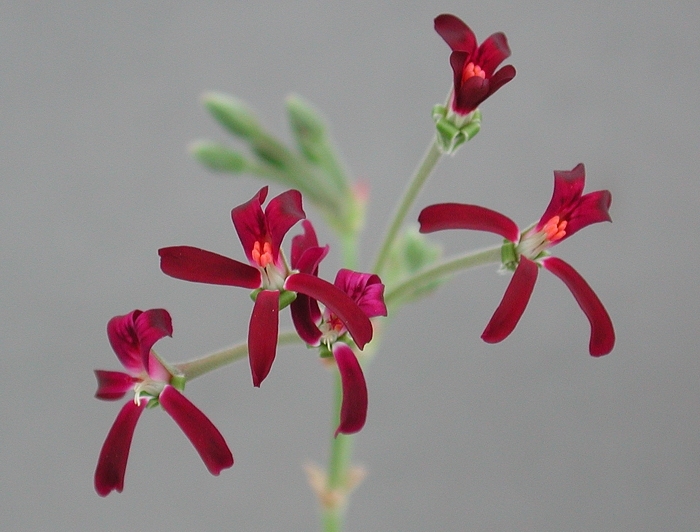 Lamina cordiform, base cordate, apex rounded, margin dentate to crenate, 15-90 mm long and wide. Petiole 70-250 mm. Stipules narrowly triangular, with acute apices, 5-12 x 3 mm, membraneous. Branched, with 2-4 pseudo umbels, each with 3-14 flowers. Pedicel 0-3 mm, rarely more (up to 18). 5, triangular-ovate. Hypanthium 15-37 mm. 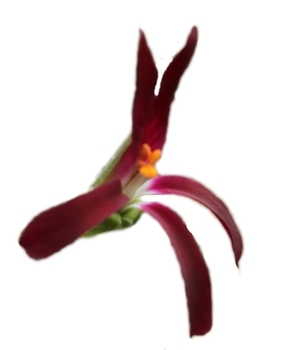 Petals dark reddish-purple, almost black, gradually recurved to more than 90 deg, Posterior ribbon-shaped with rounded apices, 12-14 x 2-3 mm, anterior three slightly smaller. 7 fertile, four long, one intermediate, two very short. 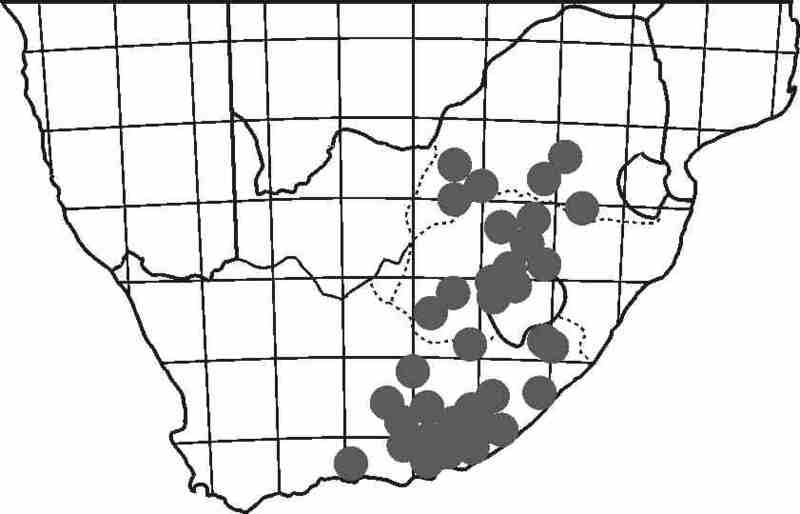 P. sidoides has a very wide distribution, here on the photo is Baviaanskloof in Eastern Cape. 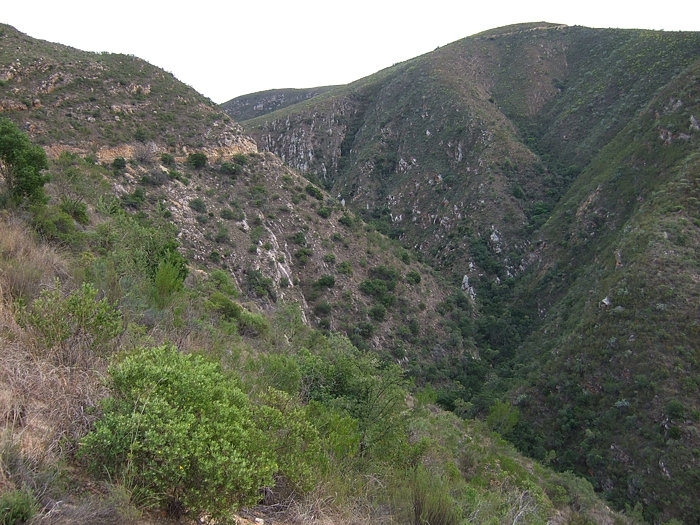 An inhospitable kloof, a treacherous 'road' and spectacular views - always a good recipe for plant spotting! For a further photograph of the habitat see the P. odoratissimum page, another Reniformia species found here. P. sidoides easily survives significant frosts, as demonstrated by the ivy-covered plant on the P. worcesterae page. I have been growing a potted plant outside in my London garden, demonstrating the resilience of P. sidoides to prolonged wetness and cold. 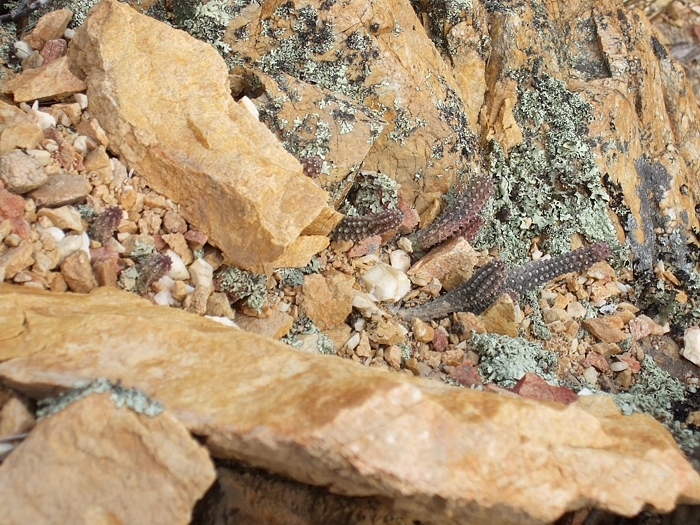 Among the more difficult plants to notice in the kloof is Huernia echidnopsioides - though not sharing its habitat with P. sidoides, the latter preferring more soil-rich spots.